Separate thread for all the pics etc as usual. 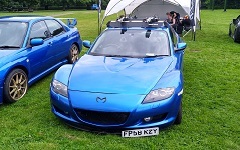 Big thanks to everyone who turned up today at Castle Combe and made it such a great day (members and non members alike) (Mazda,s and non Mazda,s alike) which makes it such a great car club community. Special thanks to Pat-Caren and crew, Dave 2112, Leroy-Rachael, Sagarth for help setting up etc. It was another great day with everyone, first track session was nice and dry and the second was a thunder storm which was a great experience. RR D585 coils and Magnecor leads. Shame I missed it this year, will hopefully make it next. Lookin' forward to hearing more about the monsoon session! Glad you all enjoyed the day, despite the rain. Blyton Sprint was great but we also had heavy rain which ultimately closed the track early. It's a great track and hard to get right. Thanks to everyone for making this such a great day. Really enjoyed my track time, and the bacon, and the cakes, and thanks to Phil for taking me out for a passenger ride during the monsoon thunderstorm. Driving in the Monsoon yesterday at Combe, was a little tentative at first, but then began to trust the Uniroyals in the wet. Folly, Avon rise and understandably Camp corner were taken a bit sedately as there was rivers running over the track!! but all good fun. Pretty Epic considering the conditions....didnt see a wobble or slide either very Casey like...smooth and consistent...welldone....glad i chickened out with old balding rear 888s think i wise decisions. Uniroyal Rainsport 3s are fantastic. 231 streetported Rx8 renny powered Westfield kit race car. 92 Rx7 fd3s stock twins..est.320bhp. Track car. They are not the best quality - I used my crappy smartphone, think its time to invest in a proper camera! Mods: Grills, Engine Mounts, AEM Intake, Sohn Adapter, D585 Coils, Whiteline Front Antil Roll & Rear Strut Bar, Tein Front Strut Bar, PI Lowering Springs, Rotary Revs Sump Guard, Toyo Catback, Steel Braided Lines, JDM Nav Hood, Fumoto Valve, Refurbed Alloys & Vreds, Engine Heater....so whats left to do???? Nice to meet you Sagar...thanks for sharing the umbrella! Got a quote from Poole tyres £100 per tyre fitted ? i buy them from Camskill and find somewhere to fit them for me. I bought my set from camskill as well this time last year, they cost less than £60 per corner fitted which is ok for the cost, got about a 1500 miles out of the rears with some heavy use including a couple of trackdays and a 4 person track limits day. Imo the compound is too soft for driving hard in the dry, you can literally see the rubber being left behind and the tc lights up more often than with my other tyres (Dunlop SP1's which are over double the price). They are also quite noisy as well but for the price and in the wet ut can't be beaten.